Joseph Geary was born in Burton upon Trent on 26 November 1882. His parents were Joseph Geary (1850 – 1895) and Mary Ann Oakden (1848 – 1926). Joseph Geary Snr was employed in the brewing industry as a labourer. On the 1891 Census Joseph was living with his parents on Wetmore Road in Burton upon Trent, which is very close to Burton upon Trent town centre. In 1895 his father died at the age of 45, leaving his mother with the difficulty of bringing up three young children, Joseph, Ernest and Percy. This obviously proved too difficult and all three children entered the Burton upon Trent Union workhouse in 1896. There is no discharge date for Joseph, but his brother, Ernest was discharged from the workhouse in 1900, and in 1901 they were both living with their older ‘brother’, Thomas in Staveley. Joseph was 17 and Ernest was 19. Both were employed as pony drivers underground. Their other brother, Percy had been given an apprenticeship with the Royal Navy. Joseph may have also joined the Royal Navy, since there is no record of him in 1911. His brother Ernest in 1911 was a stoker 1st Class based at Portland. In July 1915 Joseph married Annie Elizabeth Wright. Joseph and Annie had three children – Elsie, Roy and May. At the time of the disaster Joseph was employed at Markham Colliery as a dateller and was living with his wife and three children at 58 Lime Street in Staveley. Joseph was buried in Staveley cemetery on Saturday 14th May 1938 with 20 other of the 79 miners killed. 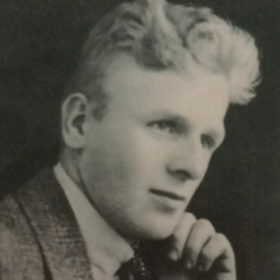 GEARY – Loving memories of JOSEPH GEARY of Staveley, accidentally killed in Markham Blackshale Colliery, May 10th 1938. “Ever in our thoughts”. From his brother Ernest and Wife, Bertha, Bill, and Irene.